This new stencil mocking Facebook has just appeared on the wall of the electrical power plant in Colegiales. It reads: “Sé lo que haces” which in English means: “I know what you are doing”. El Marian has painted a cool new portrait of Marty McFly, the character played by Michael J. Fox from the Eighties sci-fi movie Back to the Future. It forms part of a collaboration with Mati Quiroga and Marcos. The three artists painted the pieces in Agronomia last week. Pelos de Plumas has painted a new mural in Córdoba remembering Carlos Fuentealba. The teacher and union activist from Junín de los Andes in Neuquén, aged 40, was killed by police on 5th April 2007 as he and a group of protestors tried to block a road in the province. The craze first took off in the U.S.A. and yarn bombing is now catching on in Buenos Aires. Licia Santuz is the city’s first yarn bomber and has decorated trees, lamposts and railings around the Argentine capital with her beautiful and colourful designs that she describes as “graffiti with wool”. Zumi was back in Buenos Aires a couple of weeks ago and finally finished her amazing designs featuring five Giant Pandas on the walls of a bookshop in Villa Crespo. One side of the building includes a colourful mountain scene featuring four pandas. 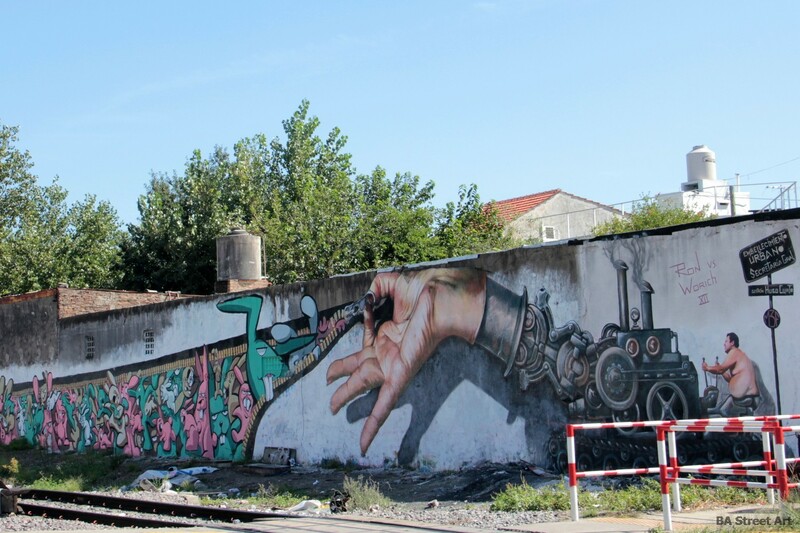 Jorge Rodriguez-Gerada has created a stunning new piece on his latest trip to Buenos Aires. The Cuban-born street artist hit Colegiales at the weekend and painted a moving portrait on the side of the electrical power plant. Lean Frizzera and Martin Ron have painted a new mural paying tribute to the retired Argentine actress Isabel Sarli entitled ‘Santa Venus’.